These irresistible dog collars are designed and made in the U.S.A. exclusively for your urbane pup! To ensure longevity, they are made with high quality steel rivets, strong nickel leash attachments, fine Italian leather and radiant Swarovski crystals. They are thicker and stronger than other fashionable collars! B.B. Simon dog collars are stylish and sturdy with inside backing made of durable bonded leather able to withstand a number of conditions including heat & moisture. The strong U.S. made, steel, beaded military dog tag chain trim is securely attached with an over locking stitch for added strength and stability. B.B. Simon Dog Collars are fancy, fun and handcrafted to last! **We do have five B.B. Simon Dog Collars available to ship right away! They are the Pink Animal Print with Rose Crystals, the Aqua Blue with Aquamarine Crystals, the Silver with Clear Crystals, the Deep Hyacinth with Hyacinth Crystals, and the Black with Clear Crystals. 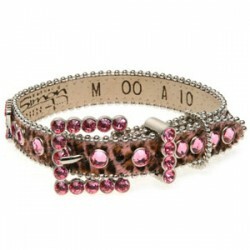 Beautiful handcrafted doggy collar with fuschia Swarovski Crystals! ****MEASURE YOUR DOG'S NECK - ..